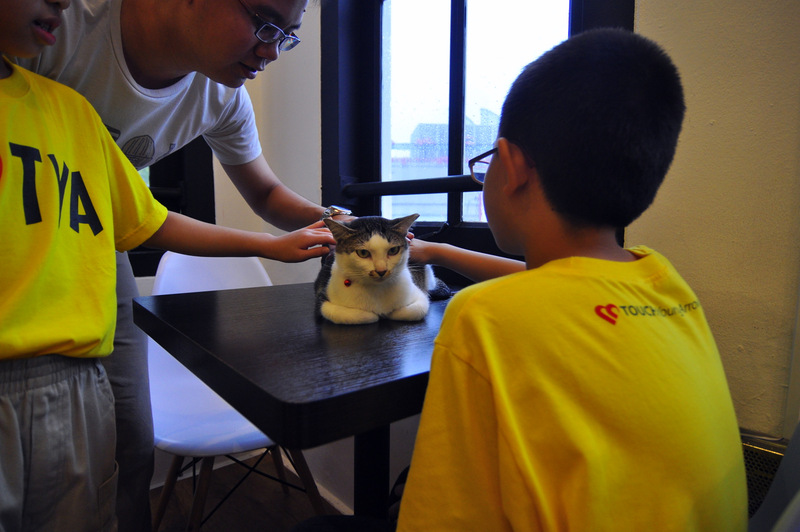 4th Oct 2014,The Cat Cafe decided to celebrate children’s day weekend by inviting children from Touch Young Arrows to a private party. 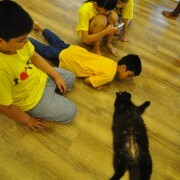 This is the first time in our short history where the number of children exceeded the number of adults + cats. The day started a little gloomy as it started raining early in the morning. 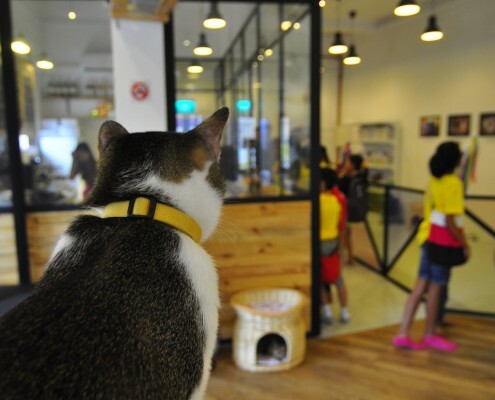 Thankfully, the rain has ceased by the time the children reach The Cat Cafe at 10:30 in the morning – just right after our cats had their morning breakfast. 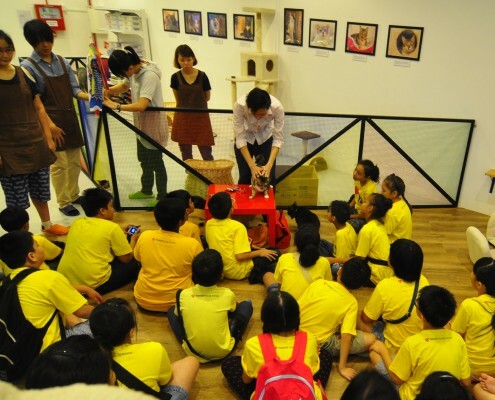 We kick started the day by having a “mass classroom session” where we taught children simple lessons on how to interact with cats and what should be avoided. Fruitcake our oldest and probably most patient cat demonstrated the art of stroking a cat. After the briefing, the children were free to roam. 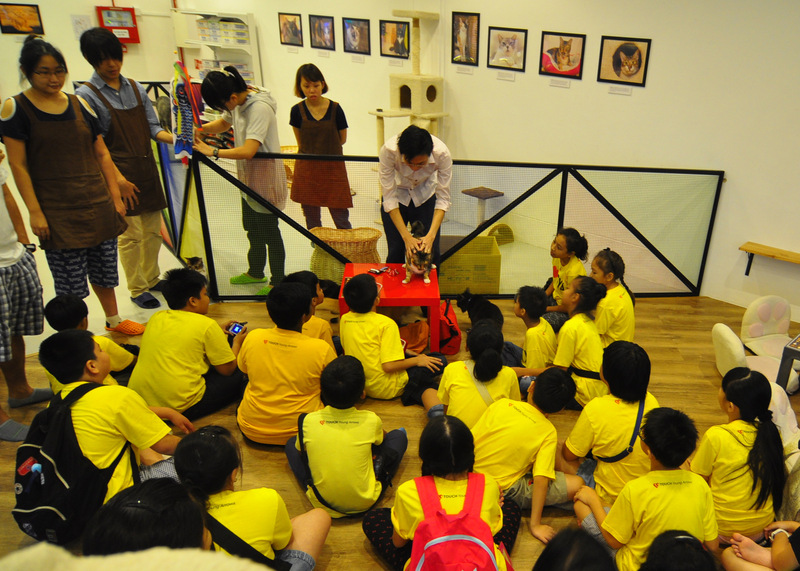 Under the careful supervision of our cafe crews, children were taught how to interact with cats in a safe and fun manner. 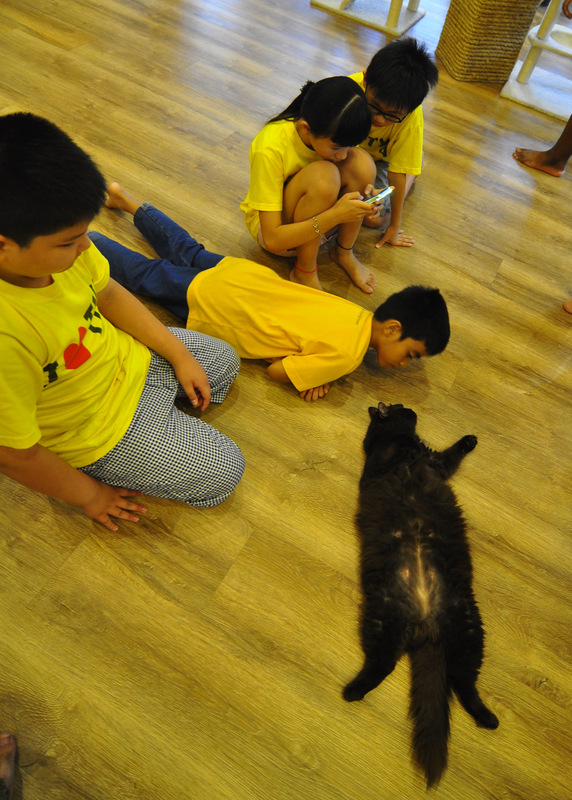 A few children who were initially afraid of cats overcame their fear of cats with some one on one coaching session by our crews. 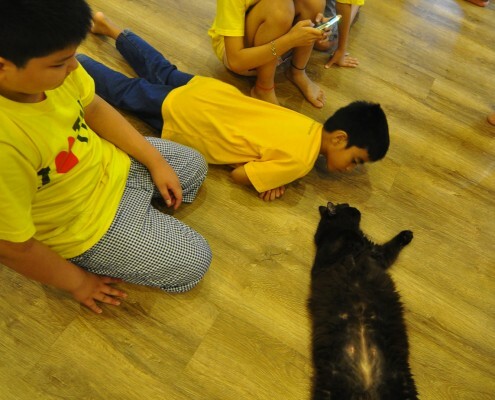 Espresso, the Boss Cat in the cafe does his usual pose and allowed children to have an up-closed encounter with him. And no party is complete without food. Our well trained cafe crews ramp up the kitchen to prepare over 30 portions Chicken Wraps to satisfy the hungry stomachs. 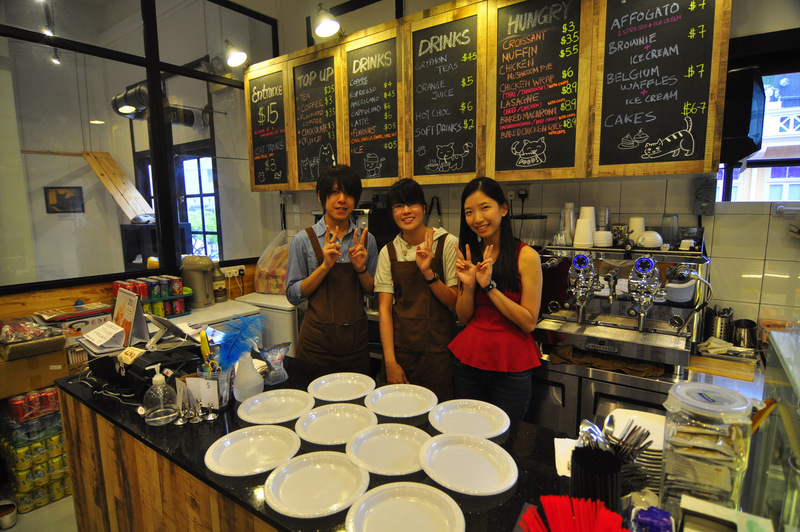 The chefs that filled the hungry stomachs. With a satisfied stomach, it was finally time to bid farewell to the children we have just become friends with. 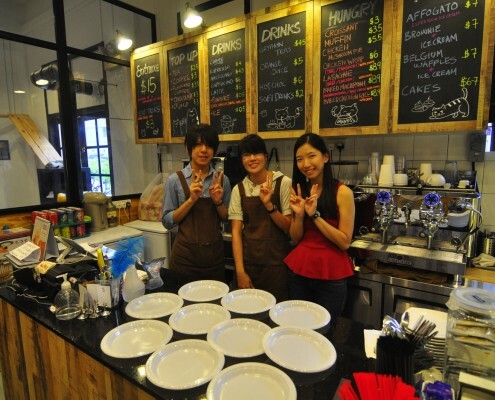 It was certainly an enjoyable time interacting with them as well as feasting with them. We would like to thank the volunteers from Touch Young Arrows and cafe crews that were off-duty as they sacrificed their precious Saturday morning to make this event a tremendous success. 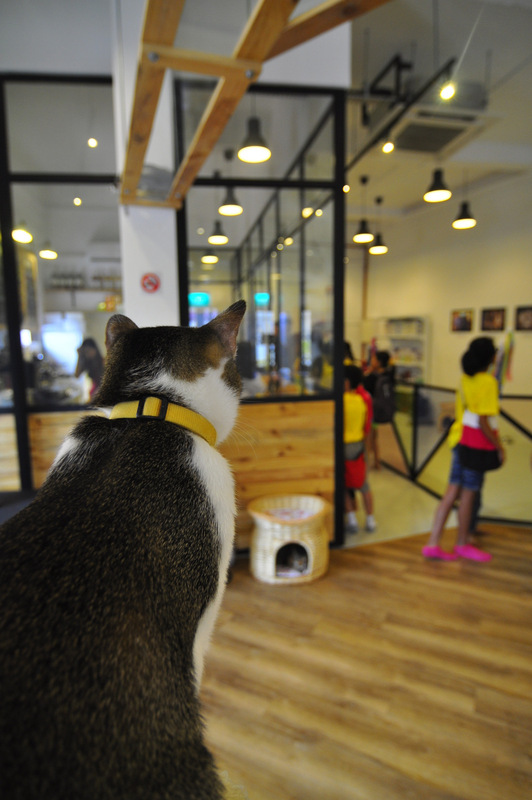 http://thecatcafe.sg/wp-content/uploads/2014/10/3-_DSC9761.jpg 1600 1143 TheCatCafe http://thecatcafe.sg/wp-content/uploads/2013/04/SMALL.png TheCatCafe2014-10-10 15:36:132014-10-10 16:06:36What happens when 21 children meet 15 cats?